Do you know someone with a sense of humour that you’d like a holiday ecard for? Our Christmas ecards for business could be ideal for you! The theme of ‘Squished Santa’ shows Santa flattened underneath a fallen tree while two elves stand idly by. It could be perfect for someone you know who doesn’t like Christmas or the idea of Santa Claus and therefore the card would make a great inside joke. If you’re planning on sending out ecards to your employees, there is no better card for you. 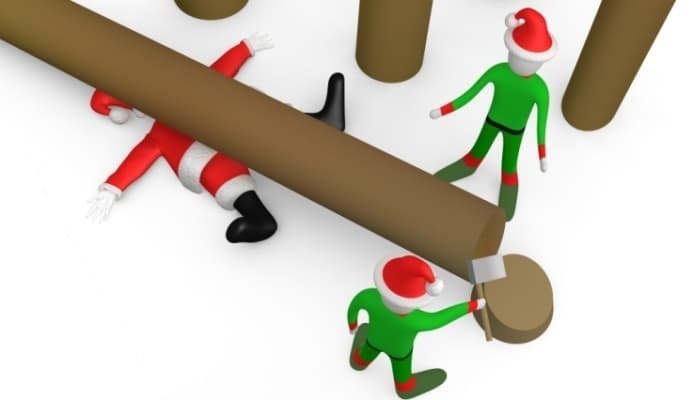 Just like the elves, I’m sure your employees have dreamed of ‘squishing’ the boss once or twice too! Add your own funny comments with a personalised message to each person and you’ll be the favourite until January rolls around again. You have a choice of other preferences after confirming your theme ecards too. The hassle of getting written cards out to work force has been removed forever with these handy and great quality ecards for business. Surprise the people in your life with a thoughtful holiday message that will tell them you appreciate them with our cost effective business holiday ecards.